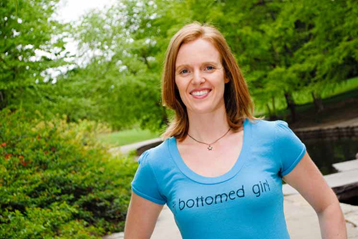 Recently, I had the incredible privilege of interviewing of one of the greats in the world of fitness blogging and one of my personal fitspirations, Jennipher Walters, CEO and co-founder of the websites, FitBottomedGirls.com, FitBottomedMamas.com and FitBottomedEats.com and author of the book by Random House, The Fit Bottomed Girls Anti-Diet. In case you’re not sufficiently impressed by those creds, you should know that she’s also a certified personal trainer, health coach, and group exercise instructor. And she holds an M.A. in health journalism. In other words, she’s one of today’s Superwomen of health and fitness. Lately, Jenn has added another title to her already robust resume: Daughter Gwen, 8 pounds and 7 ounces. I’m thrilled to report that mom and baby are doing very well and adjusting to life quite nicely (while looking pretty darn adorable) so I opted to use this opportunity to swoop in to pick her post-pregnancy brain. As I probed, she graciously divulged her secrets for a fit pregnancy and smooth recovery. Giving birth is kind of like the workout of your life, and you have to train for it mentally and physically. I can’t stress this enough. I had read that working out would help, but I seriously credit those workouts for being able to have a natural birth. They gave me strength and confidence in myself. Every single workout, run, walk and strength training session prepared me for labor. Yoga was great for my mind. Strength training kept my body strong. Cardio just helped with everything. Of everything I did though, walking was probably the most beneficial — it was the one thing I could do late in my pregnancy and it was the first thing I could do after having her. Walking helped get the baby in a good position for birth and it gave me a chance to get outside and get some sunshine! And one more thing…don’t put so much emphasis on your due date! I went 15 days late, and it was so exhausting. 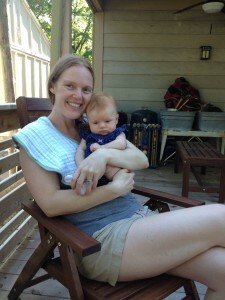 If I hadn’t been so fixated on that due date, I think I could have settled in for the longer “ride” a bit more easily. So there you have it — Fit Bottomed Pregnancies are possible and possibly awesome!! Be sure to work with your doctor to determine the safest way for you to have your very own Fit Bottomed Pregnancy. If you need ideas or help keeping up with your workouts for two, check out Jenn’s weekly workouts. And don’t forget, AcaciaTV has more than a dozen pregnancy workout videos plus an entire library for moms of all fitness levels looking to bounce back after having a baby. Thanks so much for sharing Jenn!! Got a fit pregnancy story to share? Tweet it to me here or here.